When I moved to the Pacific Northwest, part of me lamented that I was even further away from the tulip fields of the Netherlands. Imagine my surprise to learn that 90 minutes north of Seattle, the fields of the Skagit Valley bloom into a quilt of technicolor tulips throughout April each year. As a leading tulip production area in Washington, the Skagit Valley has a unique microclimate – much like the wine production area Woodinville. A combination of temperate climate, mild winters, and a healthy dose of rain help grow some of the most beautiful displays of tulips you can find in the U.S.
What is the Skagit Valley Tulip Festival? The Skagit Valley Tulip Festival is the official celebration of the tulip bloom each year. The festival occurs from April 1st to April 30th each year. Individual farmers who grow tulips in the Skagit Valley prepare all winter so that their fields are successful – and can handle the thousands of visitors each April. As the fields bloom according to the species, you can also find roses and daffodils too. The town of Mount Vernon, WA is the epicenter of horticultural fun. Here are my tips on how you can attend the Tulip Festival and have a great time. The Skagit Valley Tulip Festival officially from April 1st to April 30th. Some fields open as early as March 30th and stay open as late as May 6th, depending on the wether and blooms. Like the Cherry Blossom festivals in Japan and Washington, D.C…. it’s all up to the flowers! In 2018, the best time to attend the Skagit Valley Tulip Festival was in the last two weeks of April due to cold winter weather in March. Depending on your travel plans, I would strongly advise: do not attend the Skagit Valley Tulip Festival festival on the weekends. Though there may be more festival events happening on the weekend, a lot of ‘day trippers’ from the surrounding region (like Seattle and Bellingham) will drive up to the festival, and traffic is horrible on the weekends. Instead, consider visiting the Skagit Valley tulip Festival midweek. Book a place from Tuesday through Thursday or Friday – this will give you plenty of time to explore the area with fewer crowds. When you’re attending the Skagit Valley Tulip Festival, the best time of day to visit is early morning. You can photograph or admire the fields before they are crowded with people, and gain first admission as most of the fields open at 9am. When you arrive to see the tulips and other flowers, there are some important rules to follow. Parking can be hard to find at each field, and you may have to loop around to find a good spot. Whatever you do – don’t park anywhere you like, or along the side of the road. You may damage the fields and risk getting towed. Each field and owner have their own route you can take through their field. I know you want the perfect Instagram picture, but please be respectful of the tulips and the owner who makes their livelihood growing these beautiful bulbs. 3. Don’t Damage the Flowers. This is obvious, but if you damage the flowers, then nobody gets to enjoy them. If you visit with children or pets, please keep an eye on them too. And of course, don’t pick the flowers. 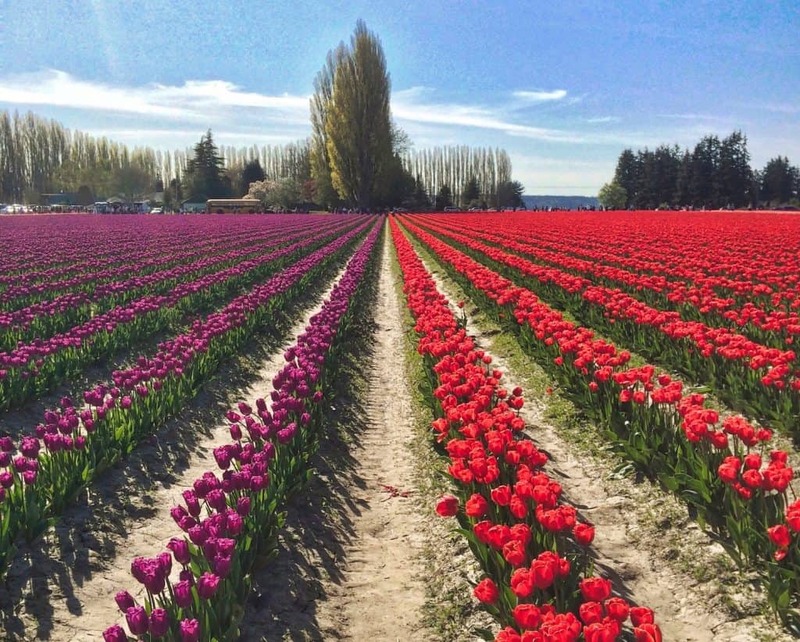 The tulips and other flowers in the Skagit Valley are carefully harvested. If you have a bike, the Skagit Valley Tulip Festival is a great time to break it out. Instead of sitting in lines of traffic, you can park further away and ride from field to field at a leisurely pace. Some accommodations also offer bike rentals, so that could be a good solution if you’re traveling from out of state or don’t have a bike. Some of the fields charge for parking and/or admission, and having cash on hand will mean you gain access to any of them. For example, Tulip Town (one of the top fields) charges $7 per person (kids under 6 are free). If you love daffodils but hate crowds, you might consider attending the Skagit Valley in March. Most of the daffodil fields bloom a few weeks before the tulip fields, so you can come admire these funny flowers without having to spend hours in traffic or wait for crowds to clear out of your picture. Each year, the Skagit Valley Tulip Festival committee creates a map that guides you to the top fields. The map is interactive depending on what is in bloom. While these fields change from year to year – and may be affected by weather and bloom times, it can be a good guide to seeing the ‘top’ fields. The Roozengaarde, along Beaver Marsh Road. Home to a big windmill, this field is one of the most beautiful and colorful. Tulip Town, along MacLean Road. Another giant, colorful tulip field with a windmill. The Washington Bulb Company Daffodil Fields – there are a lot of them! If you love daffodils, be sure to put one of these on your list. You can also just drive around the Skagit Valley and stop when you see a field that is open to visitors. The Skagit Valley Tulip Festival website has a great list of accommodations, but here are some of my suggestions too. Consider staying in Seattle (a 90-minute drive) or Anacortes (a 30-minute drive). You will have lots of accommodation choices in Seattle. In Anacortes, I recommend the Majestic Inn & Spa (more luxe) or the Cap Sante Inn (more budget). I’ve stayed at both of these properties and they’re both nice. If you’re planning to stay in Anacortes, I wrote a guide to outdoor activities and a historic walking tour guide to help you plan your time there. This can also be a better budget-friendly option, since you’re further away from the crowds of people who want to stay and attend the festival each day. 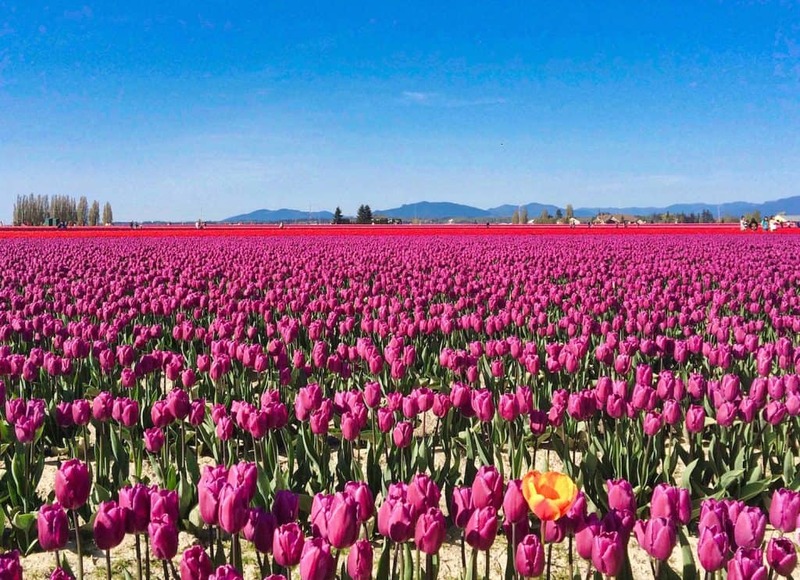 You can also choose to stay in La Connor, WA, which is about 20 minutes away from the tulip fields. I added a few La Connor properties to my Airbnb wishlist (along with the properties above). 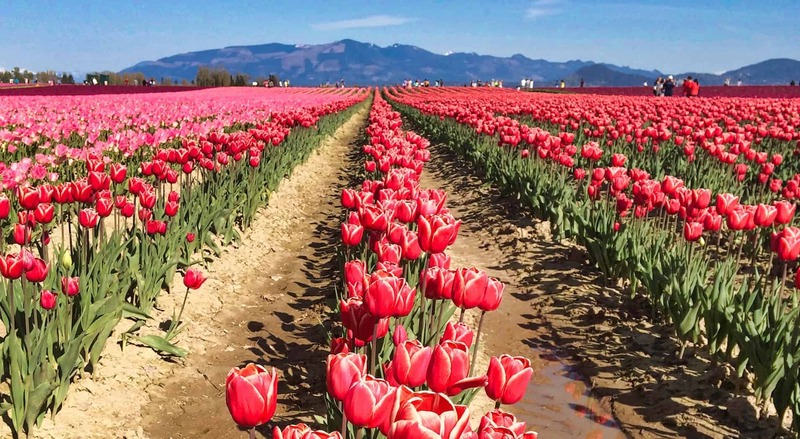 Here’s the full list of Airbnbs I recommend for the Skagit Valley Tulip Festival. If you’ve never stayed in an Airbnb before, click here to get $40 off your first stay! Have fun among the flowers! If you have other questions, please post in the comments below. This post was originally posted on June 2014 ,and was updated February 2017 and again in November 2018. Prices, dates, and links should be accurate for the 2019 Skagit Valley Tulip Festival. What a beautiful festival! There is a tulip festival about 2 hours from me each spring so this is giving me the itch to go this year! You should do it! If you’ve never been – it’s such an amazing sight to see fields of color! Your pics are gorgeous.. Hello from another PNW blogger! I have never been on your blog before….I live on the Kitsap Peninsula over the Tacoma Narrows. Anyway I have been to this years ago and am making it a point to go this year to share on my blog! Oh hey there! Are you out by Gig Harbor? I visited there and love it! Hope you can make it to the festival this year – I have a feeling it’s selling out quickly for accommodation! Don’t miss the Kiwanis Salmon Barbeque in Mt. Vernon. Glad to help, thanks for reading, Sue!